François Truffaut’s Jules and Jim begins in a state of pure bliss. According to every movie everywhere, from roughly 1800 to the assassination of Archduke Ferdinand, Europe was an embodiment of happiness. This is probably the furthest thing from the truth, but it makes for some darn good cinema. The first forty-five minutes or so exists like this. Jules is Austrian, and Jim is French. Together they explore the carefree intellectual Parisian society. They box (well, French box), degrade plays from Swedish auteurs, and try their luck with women. Writers and Bohemians, they revel in expensive cigars and the fine arts. There is a rightfully famous scene in which Jules courts the loquacious and free-spirited Thérèse (Marie Dubois). She asks for a cigarette and tells Jules he’ll have the honor of seeing her steam locomotive impression. The camera follows her around the room as she huffs and puffs, smoking almost as quickly as she talks. Who cares that she’ll eventually die of lung cancer – it’s some magical cinematography. Jules and Jim visit Albert (Boris Bassiok), a modern Renaissance man of sorts who shows them the latest archaeological discoveries. The two are entranced by the face of a marble goddess and her tranquil smile. They agree that they would chase that smile around the globe if they had to. One day, they get the chance to – a beautiful smile named Catherine (Jeanne Moreau) enters their lives. Her resemblance to the statue is awesome and dangerous. The inexperienced Jules takes up the opportunity to woo her, and it is made clear this is an extremely special woman. The two usually swap girlfriends as they please. “But not this one, Jim,” is Jules’ famous line. The trio do everything together. 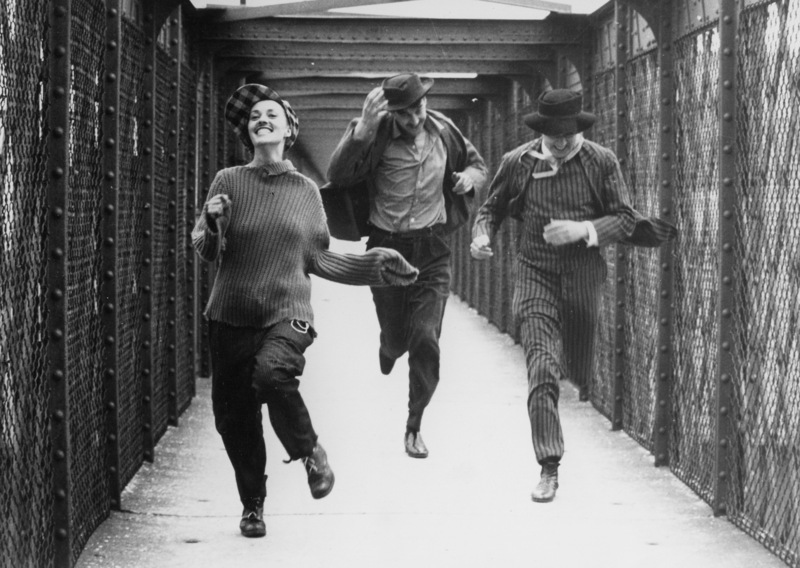 They go to the beach and the theater, and in the film’s most enduring scene, they race each other across a bridge – Catherine always a few steps ahead of Jules and Jim. They are all so happy, and the camera seems open-minded and ready to explore. Truffaut shows off Catherine’s smiles and laughter in one scene with the advent of almost imperceptible freeze frames. In another, the camera swerves haphazardly as the trio delight in trash found on the path to the beach. Jules and Catherine are in love, and Jim is happy to be included. Then comes the war. “I’m afraid of killing him in the trenches,” says Jim of Jules. Jules has been called to fight for Austria, Jim for France. The war sequence is refreshingly original. Truffaut cares not for politics or violence, instead honing in on each man’s individual battle (an idea later reflected in the dialogue). Jules yearns to return to his wife Catherine, while Jim seeks to marry old flame Gilberte (Vanna Urbino). When the war ends, there’s a noticeable shift in tone. Jules and Catherine seem distant, even though their daughter Sabine (Sabine Haudepin) has given them a common passion. Jim has not married Gilberte, and comes to visit his old friends. They greet him tiredly and resignedly, and a cold sadness pervades their meeting. “So you won the war, you devil!” Jules finally says, and the two begin to catch up. Catherine has left once already, and has had numerous affairs. One night she begins to rattle off every French wine she can think of in anger. Jeanne Moreau is a revelation in this role – fierce and enigmatic, alternately beautiful and ugly. She is matched by Oskar Werner, who gives Jules an air of nostalgia and defeat, and the little-seen actor Henri Serre, who is closeted and resigned as Jim. Jim and Catherine have always felt affection for one another, and the second third of the movie is the fruit of their inclinations. Slowly, Jules and Catherine switches to Jim and Catherine. Jules supports this – he will do anything to keep Catherine in his life. They form a strange trio, and together raise Sabine. But Catherine is fickle and unpredictable, and she leads them on wild goose chases through pregnancies and affairs. Truffaut’s cinematic artistry is almost as revolutionary as his storytelling. Wipes, pans, freeze frames, and narration (by Michael Subor) were all groundbreaking devices in 1962. The pacing, which ping pongs across twenty-five years of love and regret, feels fresh and invigorating today. We know these characters just well enough to make judgments, but not well enough for Truffaut’s twists and turns to fail to surprise us. The last twenty minutes of Jules and Jim is so achingly sad and terrible, and the latent in the trio’s relationship is revealed to be the manifest. “She’s not especially beautiful, intelligent, or sincere… but she’s a real woman,” says Jules. A real woman, and an unattainable one. Truffaut’s film is about false idols. Two happy men see a goddess incarnate and vow to spend their lives devoted to her. If only they knew what that meant. There is a scene in Jules and Jim so show-stoppingly beautiful it feels as though we have transcended all arts; music, literature, painting, stage, and film are all obsolete. Catherine and her lover have prepared a song to perform for Jules and Jim. Oh, what a sad and beautiful film this is. Jules and Jim is known in French as Jules et Jim. FINAL SAY: Jules and Jim is a beautiful and seminal classic that deserves to be seen for its marvelous storytelling and inventive direction by the legendary François Truffaut. It’s among the very best in world cinema, and for that matter cinema in its entirety.